Our closing date on the old house (which we are still living in) is approaching quickly and we are not even close to having the new house ready for move in. Only working on the weekends really slows things down, but maybe once we are living in the construction zone we will be more inclined to put in a few hours on a Tuesday evening. Either way, ready or not, here we come! When doing a renovation there are always tasks that need to happen before other tasks can take place. I tend to place a priority on certain things and then lo and behold, that task has to be put on hold because something else now has top priority. This most commonly happens when someone else is waiting on me to perform their task – such as when we have to pay a professional to take charge. That is how we wound up with half the rooms painted, but have somehow made it to the kitchen renovations. With older laminate countertops in the kitchen (2003 to be exact – based on the date printed underneath) and dated cream and pink countertops in the master bathroom, we decided that adding new granite would be worth the cost at a future resell date. I cannot emphasize enough the importance of watching cost when doing a renovation. If you are not planning on staying in the house for a considerable amount of time, it is important to make decisions based on resell and not personal preference. The granite that I really (really!) wanted for our new house was a white granite countertop with gray shading throughout. Unfortunately, this specific style (not just type) is one of the most expensive color schemes for granite. It is comparable to the cost of marble which was around $20/sf more than our budget for a house that we just aren’t sure how long we will be staying in. Mr. P and I were able to agree on a granite, but I’ll get into that later once it’s actually installed and I can give you the big reveal. 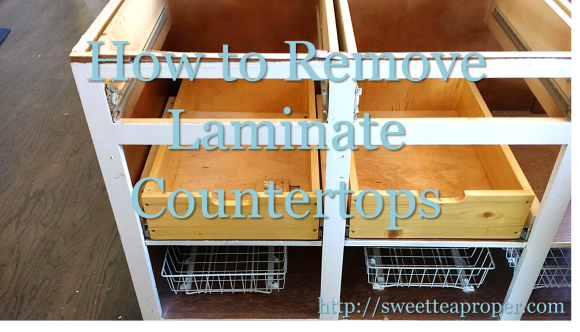 For now, let’s discuss what this post is really about and that is removing laminate/Formica countertops. While receiving quotes for the granite and installation, the issue of taking up our old countertops came up. In the first house, we took up the old countertops and replaced it with a newer more modern laminate. Since laminate countertops are not very heavy, we did the removal and installation ourselves (which saved a lot of money). Granite on the other hand is very heavy. Even if I wasn’t pregnant, there is no way that I would be any help in the installation nor would I want Mr. P risking an injury. We knew that we would have to hire a professional for the granite installation so we figured we would go ahead and get a price for the old countertop removal. To remove the kitchen countertops and bathroom vanity, the company wanted an additional $500. After a little research, it seemed that everyone wanted about $500 to remove it. With the cost of the new granite countertops being right on budget, it was not feasible to add in this extra cost. Here we go again – another DIY project on hand! Laminate countertops are either glued down, screwed down, or a combination of both. If there is a backsplash, it is generally glued to the wall and then caulked. To check whether or not the countertops are screwed down, open the cabinet doors, grab a flashlight, and look underneath the countertops. Since we are repainting our kitchen cabinets, we went ahead and removed all of the doors. This made it a lot easier for light to shine through as well as maneuver inside of the cabinet. If the countertops are screwed down, you should see several places underneath with screws (proceed to Step 3). If you don’t see any screws, it is likely the countertops are just glued down (proceed to Step 4). When removing countertops in the kitchen or bathroom, there is a good chance part of the countertop contains your sink. Turn the knobs beneath the sink all the way to the right and turn on your faucet. If the faucet still drips, you may need to turn the water off from the outside. If the faucet doesn’t drip, then you can take the wrench and disconnect the pipes from the sink. This doesn’t require a great deal of skill, but you definitely want to know what you are doing. If the sink is still leaking and you unhook the pipe, it is almost impossible to reconnect it. In short, when in doubt, have a professional look at it. Using the screwdriver, unscrew all of the screws holding the countertop in place from underneath. This is a rather pesky task since space is limited, but even if you could pull the countertop up with the screws in, it is way to risky for the safety of your cabinets. Make sure all of the screws are removed before proceeding to Step 3. Put on your gloves. Take the utility knife (preferably with a new or sharp blade) and cut the caulk around the countertop. The caulk should be fairly easy to cut through. This will loosen up the countertop from the wall and separate the sections. This is where the muscles come in. Start with the smallest section of countertop and lift up with some force. If there was any glue used, it might take quite a bit of force to maneuver it up. The countertop should eventually loosen a bit and pull up. Continue lifting the sections until all of the countertops are removed. *STP Tip – While pulling up the countertop, if your cabinet begins to crack, chip, or break at any point, stop what you are doing. It is cheaper to have someone else remove the countertops than replacing all of your cabinets. Sometimes you can find someone on Craigslist who is willing to buy the leftover countertops or you could try to give the countertops away for free. Worse case scenario, you will need to load up the old countertops and take it over to the dump. For a small cost, at least it will be out-of-the-way. With the old countertops gone, we cannot wait for the new granite ones to come in!